Coton Connection, Issue #055 - Is your Coton normal? I get asked this question a lot. Coton parents want to know if a certain behavior is "normal" or if a particular trait is typical for the breed. Is it normal for my dog to bark so much? Is it normal for my dog to be afraid of cars? Is it normal for my dog to be shy? What makes a Coton a Coton anyway? Physically there are different sizes, haircuts, and colors within the breed. Personality and temperament can also vary quite a bit. Some are territorial and others aren't. Some are finicky eaters and some will eat ANYTHING. Some like to swim, some don't. Some like to watch TV and some like to chase ducks. Some get anxious when left alone and others could care less. Some like to be groomed and some hate it. While many Cotons share the same traits and characteristics, they are all special and have their own individual personalities and eccentricities. 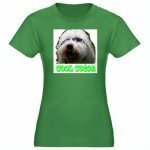 Instead of asking whether your dog is normal, a better question may be "how well do I know my Coton?". Since dogs and humans don't speak the same language, it can be frustrating at times to figure each other out. Our Cotons are intelligent and can pick up on our body language and tone of voice pretty quickly. But do you understand your Coton's body language? The best way to understand your dog's signals is to get to know your dog. Instead of comparing him to other Cotons, get familiar with his unique personality and behavior. 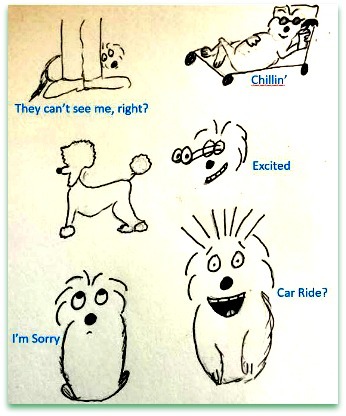 What is your dog's "normal"? One clue is your dog's tail - it tells stories. Do you know what your dog's tail is telling you? Here are some other common body language interpretations to help you sharpen your communication skills. Guilty Dog It's been said that dogs don't feel guilt. Hmmm. We've all seen this look. This is a body language that Luc excels in. Maybe guilt isn't the correct emotion, but I think dogs definitely know the difference between right and wrong. I'm sure Luc understands that going through the trash is wrong, or he wouldn't wait until I was out of the room to do it. Yawning can mean your pup is tired or it can be a sign of stress. Dogs often yawn to calm themselves down. A low tail can mean fear, submission, or just that your dog's not feeling well. A wagging tail can be a sign that your dog is happy, but it can also be a sign of aggression. If his tail is wagging AND he's barking in a tense defensive manner, this is a sign of possible aggression. So you have to be somewhat of a detective and put all the pieces of your dog's story together. In addition to your dog's body language, is he eating? Is he sleeping well? Is he barking excessively? Has one of his stressors been triggered (strangers, noise, veterinarian)? There are some characteristics that many Cotons share such as standing or dancing on hind legs, sitting on couch tops, speed running (affectionately referred to as zooming by some), and listening curiously with head cocked to the side. 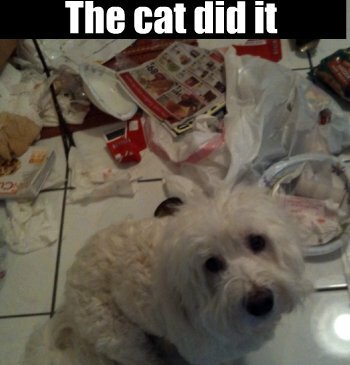 If your dog has never done these things, it doesn't mean he's not normal. Every dog is unique and has his own personality and behaviors, even within a specific breed. Below is a poll we have on the site. 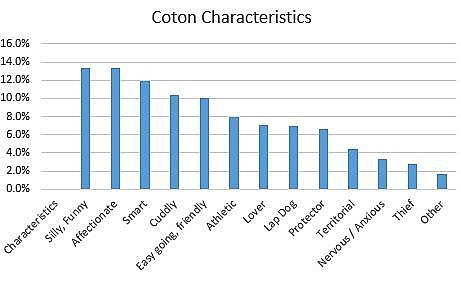 You can see that some personality traits are more common in the Coton than others. While Luc has typical characteristics such as being affectionate, funny, and smart, he also displays traits that are less "normal" such as being a thief and a protector. These behaviors are Luc's normal. As they say, normal is highly overrated. The perfect dog is the one you have. Just for fun - Did you know? People see better than dogs during the day, but dogs see better at dusk and low light times of day. 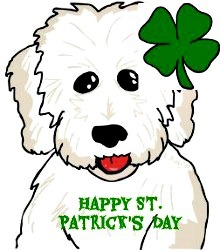 Dogs can't see red or green. You may not want to throw a red ball into your green yard. Dogs hear 4x better than humans and can hear high pitched noises that humans cant hear at all.